The ancient Mayan legacy of the construction and keeping of time, is mirrored through backstrap weaving in contemporary Guatemala. It is a highly technical and process-driven practice. I had the pleasure of being the first patron on the Immersive Textiles Tour for 2018 hosted by the Maya Traditions Foundation. 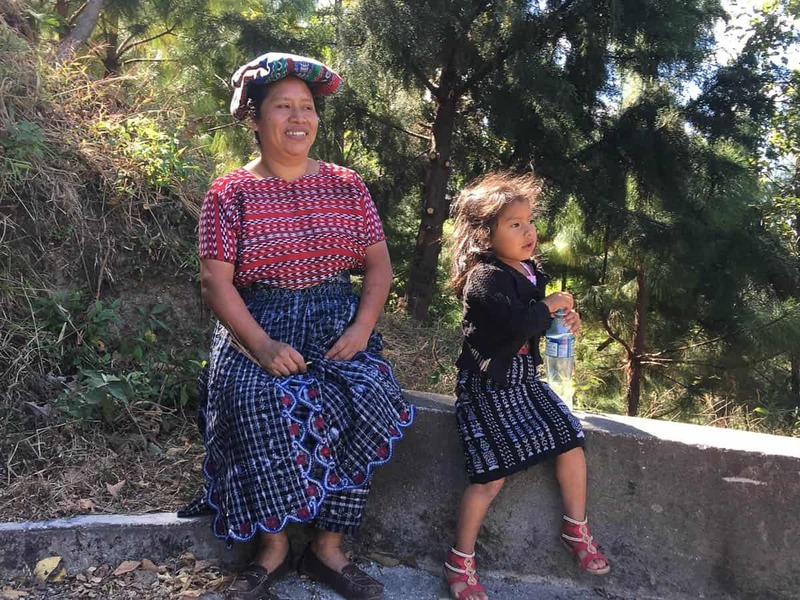 The Maya Traditions Foundation is a non-profit social enterprise based in Panajachel, Guatemala. 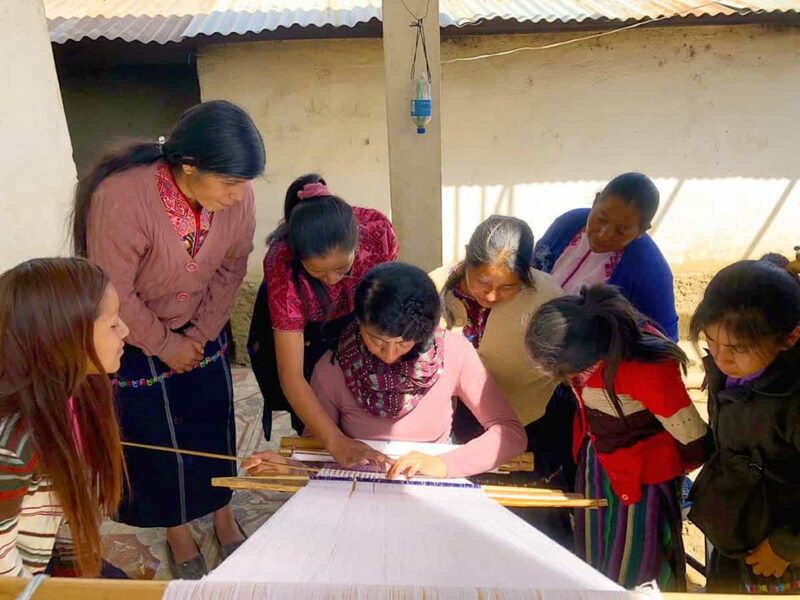 This 6-day Immersive Textiles Tour gave me an invaluable opportunity to witness how the local Master Weavers’ created some of the most exquisite textiles I have ever seen. 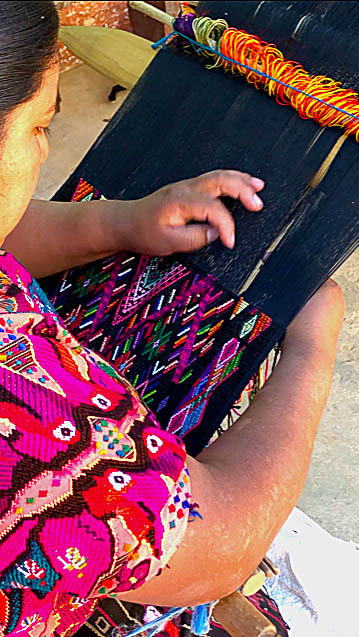 The revival of this method pays homage to a self-sustaining lifestyle that involves the processing of organically dyed thread (only one of the communities produce their dye themselves). It is at once a celebration of the handmade, a strengthening of community, sisterhood and respect for Elders. The Foundation has been a springboard for the preservation of traditional cultural identity as well as enabling the women to earn an income. For me, this tour was a “thread” that forms part of the Foundation’s series of programmes including Artisan Development, Community Health, Youth Education and Fair Trading. 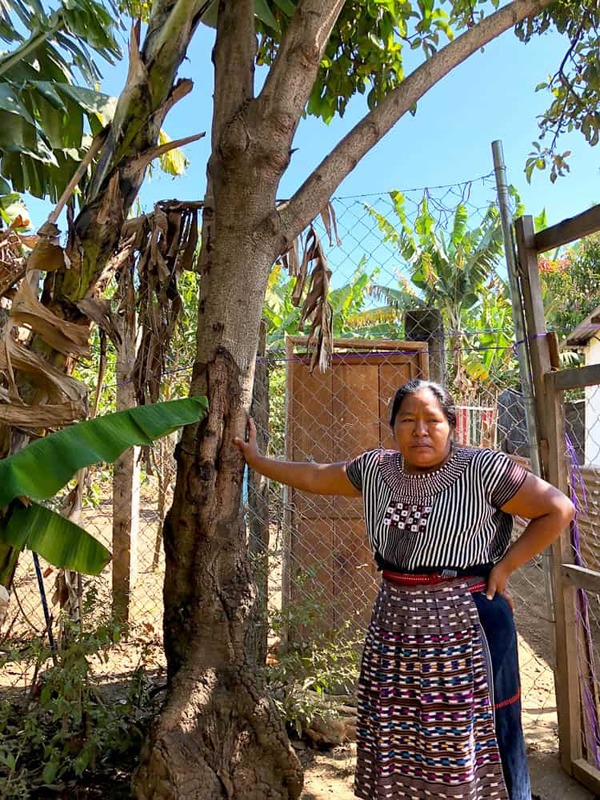 To date, the Maya Traditions’ Foundation has helped weave six Mayan communities from Patanatic, Nahualá, Chirijox, Quiejel, Chuacruz and San Juan, into a network of craft-based practitioners both locally and internationally. Brocade demonstration by Master Weaver Yolanda in Quiejel. This master weaver explained as she was weaving with her fingers, that the designs (including her choice of colour palette and what kind of object i.e. a blouse, skirt, table runner or belt) that she would like to produce. These are mapped out in her head as she is creating the patterns on the loom. 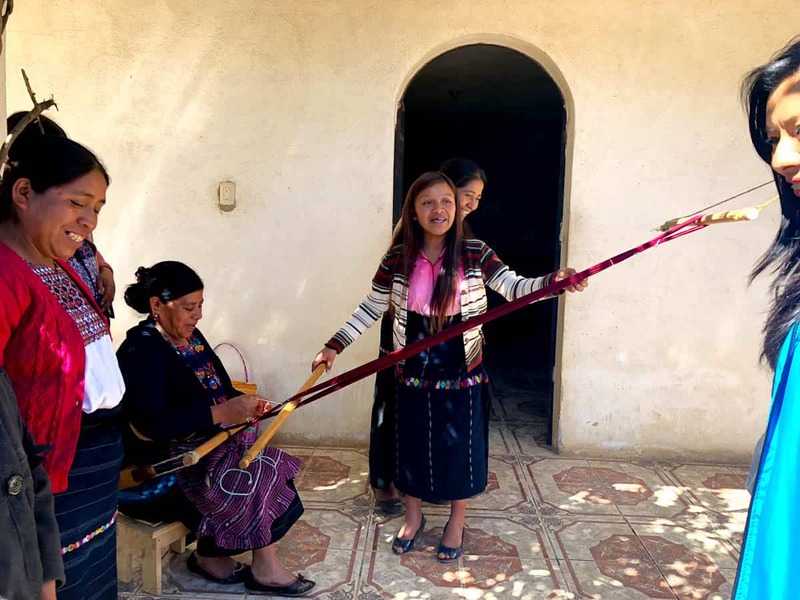 Upon gaining membership to the foundation, the women from the various communities are initially taught (or hone on existing skills) to work with the backstrap loom process with designs, colours and measurements. The foundation provides them with the thread and necessary tools for each textile order made. 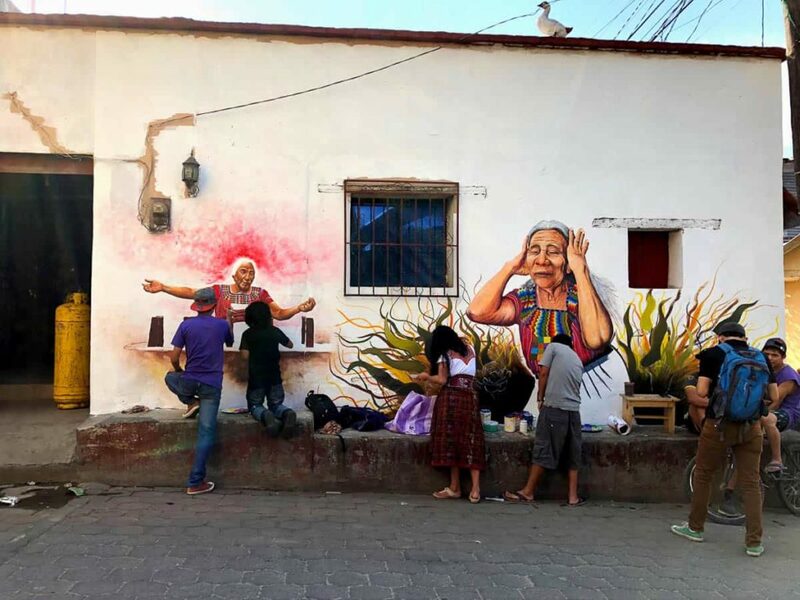 The creation of a mural on a street in San Juan which comprised of Grandmotherly figures. Here, I am receiving Brocade tuition on the backstrap loom under the watchful eyes of the Master Weavers in Nahualá. Image courtesy of Dina Salpor (Ethical Tourism Coordinator of Maya Traditions Foundation). 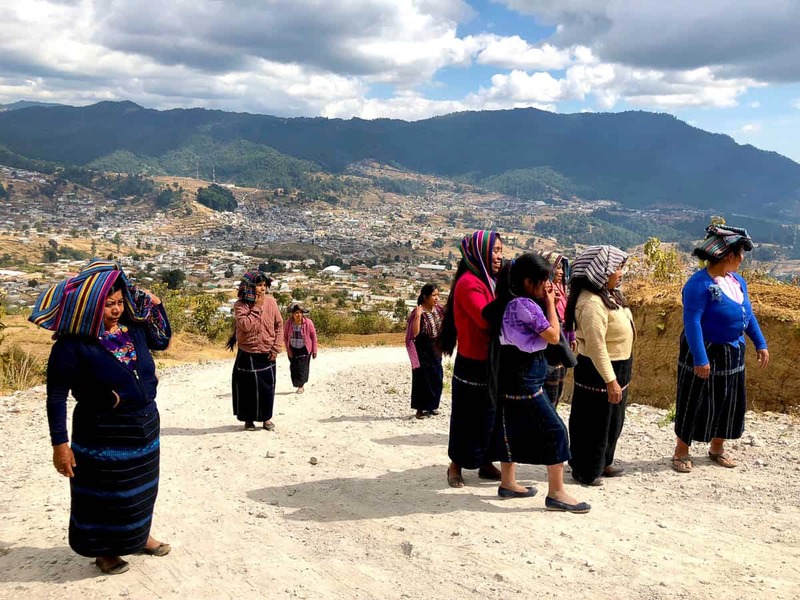 The Master Weavers in Nahualá accompany me for a walk up the Yellow Stoned hill to see the beautiful view of the valley of Nahualá. I think at this point we noticed a wild donkey loitering on the path, coming towards us. 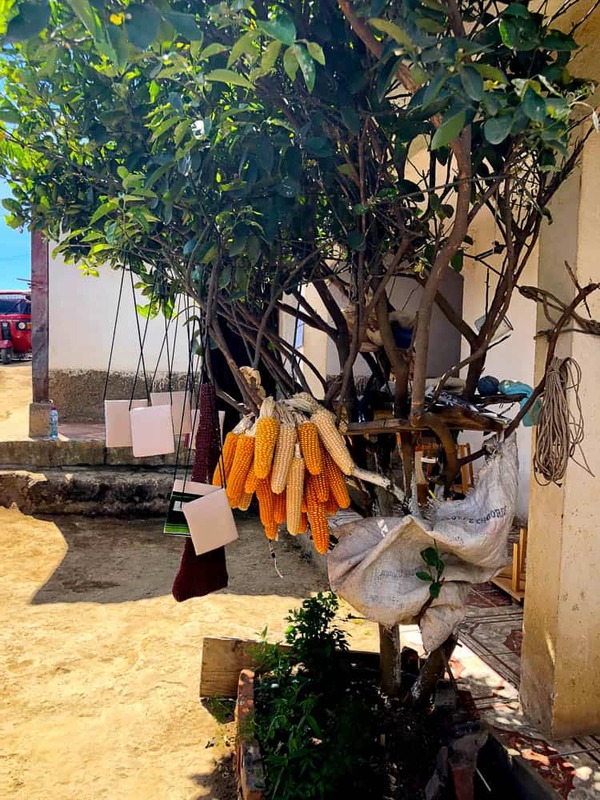 Dried corn hanging in this lime tree amongst utilitarian objects such as hand-made bags, a tin cup, thread, rope, a washcloth, plastic hessian bag, a built-in makeshift platform. This lime tree resides at Master Weaver, Isobel’s, house where I was kindly hosted during my visit in Nahualá. 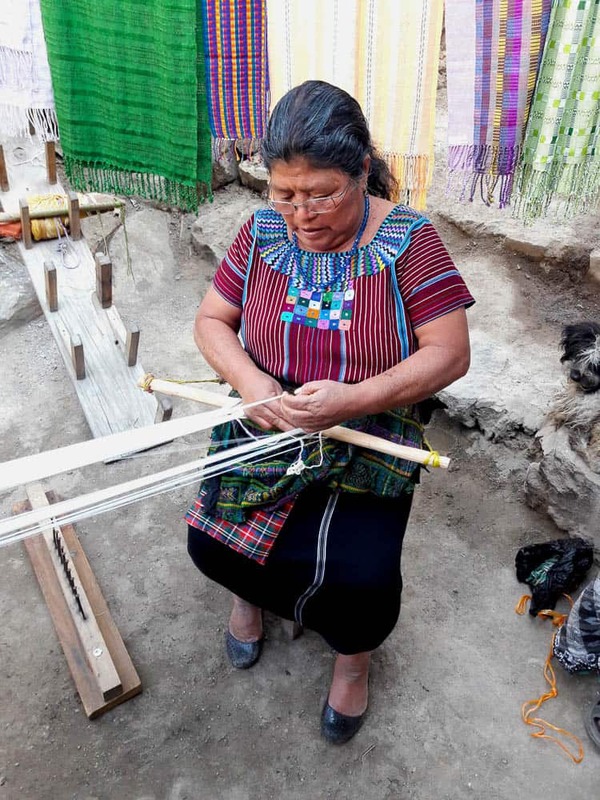 Mid action of the Nahualán Master Weavers preparing the Backstrap Loom to demonstrate how it works. The woman wearing blue on the far right, is Dina Salpor, the Ethical Tourism Coordinator for Maya Traditions Foundation. Dina was my brilliant guide during the tour and has a mutually respectful rapport with the six communities that the Foundation has a current agreement with. Master Weaver, Maria Cecilia, after showing us around the Dye and Medicinal plant garden in San Juan, she explained how the Banana Tree sap is used as a fixative, the foundation (mordant), in the dyeing process. Master Weaver, Maria Clara, from San Juan demonstrating an Ikat (Tie Dye) technique with a backdrop of weaving related apparatuses and handmade scarves (produced from the San Juan Master Weavers – Flor Juanera). Image courtesy of Katharina Anna (Intern at Maya Traditions Foundation and fellow traveller). 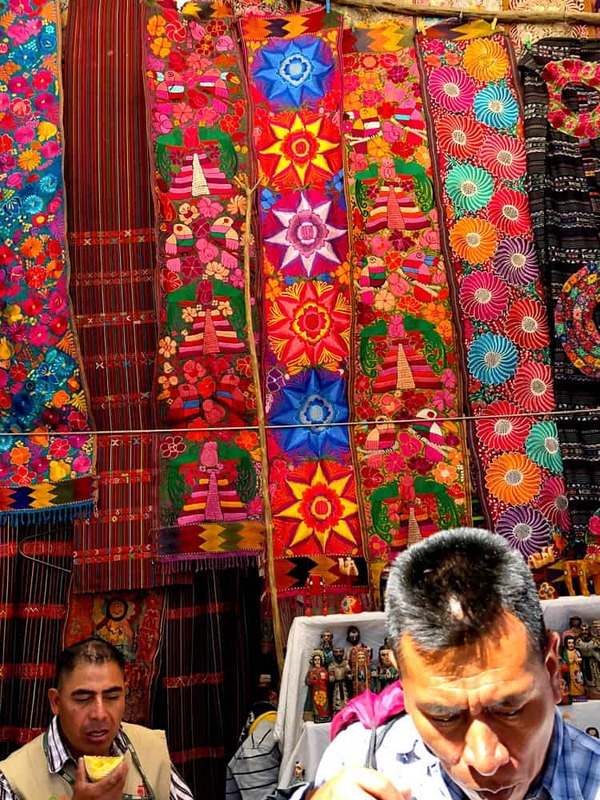 Expensive factory-made table runners made of synthetic dyes and threads on display at the Chichicastenango Market. Chichicastenango market is renowned for being one of the biggest tourist markets in Central America. The patterns and colours represent the Quiche / Chichicastenango. A Master Basket Weaver and her young friend from Patanatic, taking rest during a hike up to the local pine forest. Patanatic is a small town well known for its pine needle basket weavings. Image courtesy of Karen Tourney (a fellow traveller). Muchas gracias to Dina Salpor, Laura Gehring and the Master Weavers. 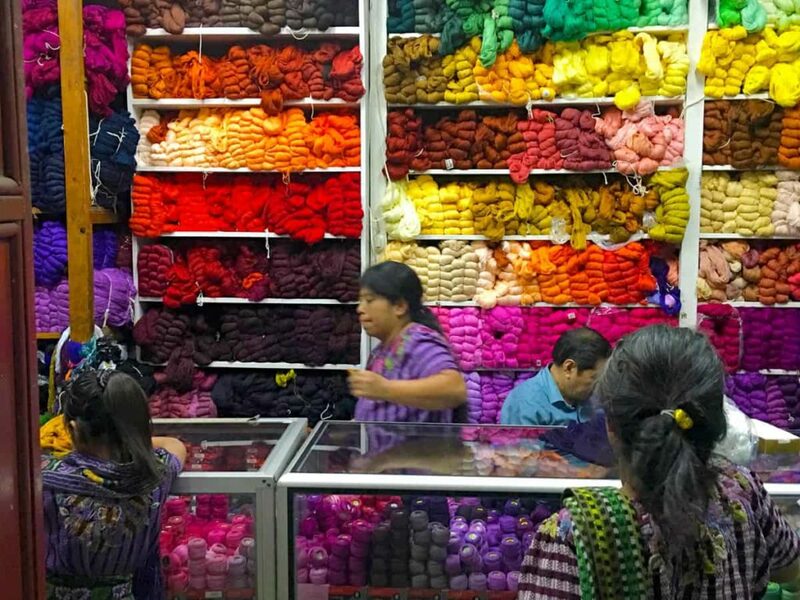 The Immersive Textiles Tour was part of a 5-week Self-Initiated research and development project that spanned across Peru, Mexico and Guatemala. The research project was exploring transitional rites focussing on death, the afterlife and rebirth through participating in spiritual ceremonies and visiting sites of where significant textiles, sacred rituals and funerary objects previously/or currently performed, produced and/or housed. This experiential-based project was part funded by the National Association for the Visual Art’s (NAVA) 2016 Sainsbury Sculpture Travel Grant. ✿ How do you think this experience has affected your work? In retrospect, I think that this experience has inspired me to continue celebrating the handmade and work with a diversity of materials as well as approaches to producing art. It has also validated my decision to continue walking the path as an artist. Ann Fuata is a Melbourne-based artist of Sāmoan-Hawaiian-European bloodlines. 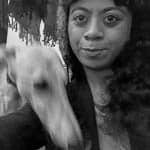 Fuata graduated with a Bachelor in Fine Art at the Victorian College of the Arts in 2010. Fuata has a process-based practice that spans across performance, installation, video and sculptural objects. NB: Selfie with housemate, Tess, a retired racer whitehound with a gentle heart.